Form 11thto 13thof March project partners from 7 countries (Finland, Denmark, Germany, Switzerland, India, Mexico and Spain) came together at ETSAV for holding the second international meeting of the SLA project. During 3 days, partners presented their individual results and experiences made during the first round of the 3-year SLA project, and worked together intensively on the design and functionalities of the future SLA web platform. 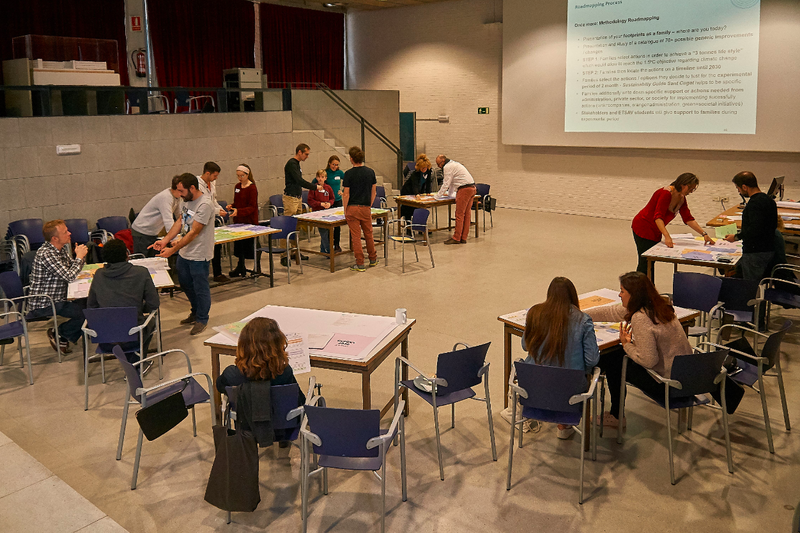 A Co-creation session held at LOW3 Living Lab with external stakeholders form the municipality of Sant Cugat del Vallès as well as UPC students which worked on the platform concept, allowed to advance in the definition of specific concept, appearance and functions of the future SLA platform. Students of our MOOC Course LOW3: Living zero! started their final exercise on energy efficiency and solar potential adopting the role of energy consultants to our SLA pilot families, analysing the specific energy parameters of a real private household. In a first step students analysed existing data about energy consumption, type of energy used and other available information about the energy system and energy use of the households. In a second step students did the energy certification of a specific household and described possible improvements of the overall energy performance. This included the use of online tools and a visit to the family’s home for raising detailed data about the building envelope, façade and window qualities as well as existing active energy systems. In a last step, students analysed the solar potential of the household for a roof-top PV installation, gathering data about the building’s roof and using an online simulation tool in order to calculate the possible annual PV electricity production. All these exercises resulted in a report to the SLA pilot families, useful for them in order to optimize the energy performance of their home through behavioral change and building management, and for taking decisions about a possible investment into energy efficiency measures or a PV installation. This approach to the real-world energy performance of existing buildings as part of our innovative educational offer at ETSAV is another example how our students are getting prepared for being active change agents of society, facing real problems of our buildings and cities within a holistic understanding of sustainability in its economic, social and environmental dimension. Linking regular teaching at UPC and a research project like SLA in the context of Living Lab LOW3, allows offering this unique learning approach to students. BONES FESTES / MERRY CHRISTMAS! 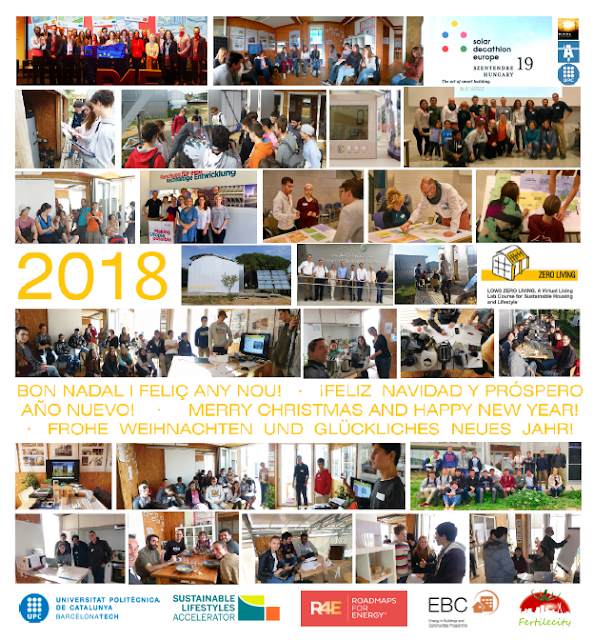 Thank your for a 2018 full of interesting projects and interesting people! We wish you a 2019 full of circularity, collectivity and positive transition! This week pilot families of Sant Cugat came together for exchanging their experience of the last 3 weeks regarding the implementation of their ambitious Roadmaps towards a “3 tonnes lifestyle”. Families got updated about the activities of the other 6 international partners of the project and then explained their personal experiences and success stories regarding smaller and bigger changes in their daily lifes. Especifically changes in their consumption habits, regarding food, and regarding mobility have been discussed. All families said to be happy with their choice to implement real changes in their daily routines, although time constraints, economic reasons and in general our fully packed daily agendas require extra efforts for making changes real. For mid to end January a detailed evaluation of real changes is planned, with a quantification of the carbon footprint reductions achieved by the families. A “Future Workshop” then will close this first round of the SLA project in order to start the second round which will use all experiences made for designing the SLA online platform, up scaling the SLA experience to the next level. The SLA project representatives from Switzerland, Germany, Finland and Spain met with project managers of similar German initiatives at the Potsdam Institute for Climate Impact Research (PIK) for exchanging experience, discussing the Upscaling challenge of each project and looking for opportunities for further collaborations. Beside SLA, three other projects have been presented: the HOPE project from Tübingen, the CLIMATE CULTURE LAB (CCL) (www.climateculture-lab.de ) and the KLIMA NEUTRAL BERLIN (KLIB) (https://klimaneutral.berlin) project by PIK. Individuall and collective behavioural change, value discussion and the activation of the collective intelligence of society, necessary for real changes under the increasing pressure of global climate change challenges have given place to interesting reflections and conversations among the participants. In a first step the results of the Quick Footprint Questionnaire, which allowed to analise the current material and carbon footprint of our families, have been presented, with detailed information about their impact inf the fields of housing, mobility, food, consumption and leisure activites. It showed that footprints where quite diverse, from arround 3.8t up to over 18 tonnes of CO2 per person. A more detailed look at the results showed that mainly long distance travelling has been the cause for individual elevated footprints, and interesting discussions arose regarding the impact of mobility and posible future changes in order to mitigate these impacts. As second step a range of over 70 "actions for footprint reduction" have been presented to the families, with detailed information about the individual contribution of each action to a lower carbon footprint. One day of working at home instead of traveling 20 km to the office by private car would allow for savings of arround 120kg CO2 a year. Changing to a 100% renewable electricity supplier might have an impact of arround 900kg CO2 per year, depending of the current supplier and its energy mix, as well as the individual consumption pattern. With this detailed information about specific options, families designed a set of actions which would bring them to a "3 tonnes CO2 per person lifestyle", considered an important milestone for 2030 in order to limit global warming to 1.5ºC in 2100, and before aiming for a "1 ton CO2 per person lifestyle" in 2050. After this exercise, families entered into the third part of the workshop: locating their individually selected options on a timeline to 2030 in order to define which action might be implementated in which moment. Through this las step, families achieved creating their personal and specific roadmap towards a more sustainable lifestyle, which is now ready to be implemented! Based on this first experiences in all 7 partner countries, the SLA project aims to develop in the upcoming 2 years an online platform which will allow the personal calculation, roadmapping and tracking of the CO2 and material footprints of private households through digital tools. During the next 2 month our pilot families will start implementing their roadmaps, we will support them together with local stakeholders like the municipality of Sant Cugat, and we will gather further knowledge how to foster the process and improve the success of the Sustainable Lifestyle Accelerator methodology. 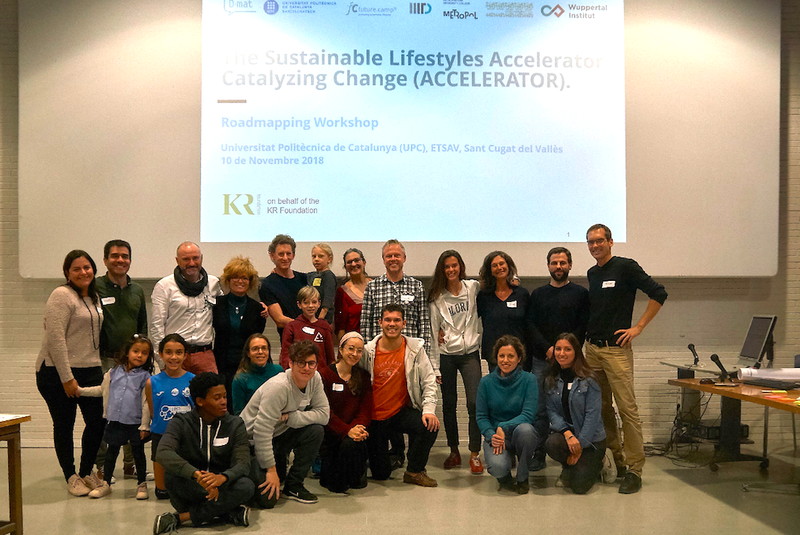 Convidem a associacions, entitats publiques i privades, empreses i comerç de Sant Cugat del Vallès a col·laborar en el projecte SUSTAINABLE LIFESTYLES ACCELERATOR (SLA), recolzant a les famílies pilot del projecte en la seva transformació cap a un estil de vida més sostenible! A mesura que passen els anys, els recursos naturals són més i més escassos i el canvi climàtic progressa. Com afecta aquest fet a la nostra vida diària a Catalunya i quin tipus de serveix i productes són necessaris per a la promoció d’un estil de vida més sostenible? Aquesta qüestió s’investiga al Sustainable Lifestyles Accelerator (SLA). El projecte està coordinat per l’Insitut Wuppertal d’Alemanya i D-mat Ltd. a Finlandia amb la participació de socis internacionals de set països (Alemanya, Dinamarca, Espanya, Finlàndia, Índia, Mèxic i Suïssa). La Universitat Politècnica de Catalulnya (UPC), mitjançant el Living Lab LOW3 de l’Escola Tècnica Superior d’Arquitectura del Vallès (ETSAV), gestiona la participació espanyola en col·laboració i amb el recolzament de l’Ajuntament de Sant Cugat del Vallès. Actualment, ha començat la primera fase del projecte amb un petit grup de famílies pilot de Sant Cugat del Vallès, i també ha començat el disseny preliminar de la plataforma calculadora en línia per a l’avaluació de l’impacte ambiental de les famílies. De cara a l’any 2019, es planteja la participació de 500 llars, i de cara al 2020 la participació de 10.000 llars per cadascun dels 7 països socis, creant un impuls únic de compromís social i canvi real cap a estils de vida amb bona qualitat i, alhora, amb un impacte ambiental reduït. A dia d’avui, les famílies pilot estan monitoritzant els seus consums. En base a aquests consums actuals, un consorci d’experts calcularà dos indicadors d’impacte ambiental: per una banda, calcularà la petjada de carboni de cada família, és a dir, les emissions de diòxid de carboni associades al seu estil de vida; i, per una altra banda, la seva petjada material, és a dir, el consum de recursos naturals necessaris per a mantenir-lo. A partir de les seves petjades individuals, les famílies desenvoluparan el seu propi full de ruta per arribar a estils de vida més sostenibles en un taller conjunt. A tal efecte, se’ls presentarà un catàleg de fins a 100 actuacions o opcions de canvi. Les famílies escolliran les actuacions que posaran a prova en un experiment d’entre un i dos mesos, d’entre les opcions presentades al taller. En projecte similars anteriors, els participants aconseguiren reduir les seves petjades entre un 10 i un 20%, aplicant moltes solucions que, a més a més d’ajudar-los a reduir el seu impacte ambiental, reduïren costos de les famílies augmentant la seva qualitat de vida. Algunes solucions experimentals podrien incloure, per exemple, car-sharing, serveis d’entrega a domicili, solucions eficients als habitatges, solucions de mobilitat de baix impacte ambiental o noves formes de proteïnes. Les solucions que es posin a prova es seleccionaran i implementaran de manera col·laborativa entre experts i participants, i amb l’ajuda de les entitats col·laboradores. This international 3-year project will allow private households to design their personal pathways for reducing the environmental impact of their daily life! The project will mobilize more than 70 000 households in seven countries (Germany, Finland, Switzerland, Denmark, Spain, Mexico, India) to analyse their material and carbon footprints, and to plan, implement and track footprint reductions by behavioural change. The project develops also the tools for further up-scaling the approach. To guide and support such a transition, the ACCELERATOR will provide online and offline tools for footprint calculation, individual roadmapping and experimenting, and sharing experiences for up-scaling. This project is financed by the KR Foundation, Denmark. UPC BarcelonaTech is the official Spanish implementation partner, with Wuppertal Institute (Germany) and D-Mat (Finnland) as coordinating entities. copyright CISOL (UPC). Tema Sencillo. Imágenes del tema: TommyIX. Con la tecnología de Blogger.